Khazanah Nasional Bhd plans to divest its entire 30% stake in Bank Muamalat Malaysia Bhd in the proposed merger between the lender and Malaysia Building Society Bhd (MBSB), sources say. “It doesn’t plan to stay on as a shareholder in the merged entity. It has been looking to sell for a long time now ... it wants cash to exit,” a source familiar with the matter tells The Edge. Another reason for the planned divestment, the source adds, is that Bank Negara Malaysia is not keen on the government investment arm owning major stakes in more than one bank. It already owns 29.34% in CIMB Group Holdings Bhd. 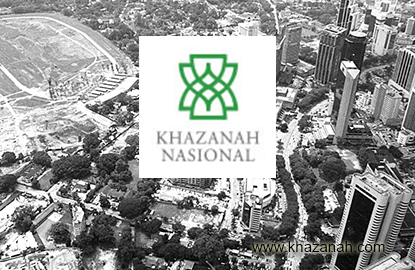 That it plans to sell the entire 30% stake isn’t exactly surprising considering that Khazanah has long made it known that it considers the stake a “non-core holding”, which meant that it was open to letting it go at the right price. Last Thursday, MBSB said in a stock exchange filing that it obtained the central bank’s nod to commence talks with Bank Muamalat’s shareholders for a proposed merger between the two financial institutions. Bank Negara has given them three months to complete the negotiations. Conglomerate DRB-Hicom Bhd holds the remaining 70% in Bank Muamalat. MBSB, a non-bank lender, is 65%-owned by the Employees Provident Fund and is about twice the size of Bank Muamalat in terms of assets and loans. If it takes off, the merged entity would be the second largest Islamic bank in the country, after Maybank Islamic Bank Bhd. A merger will enable MBSB to address its high funding cost issue by using Bank Muamalat’s wide network of 60 branches nationwide, say analysts. This is because MBSB (fundamental: 1.20; valuation: 3) will be able to tap Bank Muamalat’s branches and self-service machines to grow its deposit base. MBSB has only 46 branches. And more importantly, it will allow MBSB to become a full-fledged Islamic bank that can tap the interbank money market for funds. “The merger will allow MBSB access to Bank Muamalat’s branch network, and they can also access the interbank money market, a source of funding currently not available to MBSB as it is not a bank,” says an analyst who tracks MBSB. Assuming no branches are closed, the merged entity would have 106 branches across the country. A larger network will allow the merged entity to get better access to deposits from retail customers. Individual deposits is generally the cheapest form of funding for banks, with interest below the official inflation level. However, the merged entity will still have to address the issue of low retail-based deposits, as both MBSB and Bank Muamalat’s deposits from individuals make up 7% to 8% of total deposits, observes analyst David Chong of RHB Research. “Cost synergy is a possible merger benefit while asset quality and deposit gathering are potential areas the merged entity may need to address,” Chong says in an Oct 2 report. The combined entity will have total assets of RM62.1 billion and gross loans of RM47.5 billion. This leaves Maybank Islamic still far ahead in size, with assets and loans of RM160.9 billion and RM121.9 billion respectively. Talk of a possible merger between MBSB and Bank Muamalat has surfaced ever since a planned three-way merger between MBSB, CIMB and RHB Capital Bhd was aborted in January because of unfavourable economic conditions. Affin Hwang Investment Bank says that earlier merger talks involving Bank Muamalat were unsuccessful due to asset quality issues. The Edge reported earlier in July that the central bank had given DRB-Hicom up till February next year — said to be the final extension — to pare down its stake in Bank Muamalat to at least 40%. DRB-Hicom, controlled by prominent businessman Tan Sri Syed Mokhtar Albukhary, had bought the stake from Bukhary Capital Sdn Bhd — also controlled by Syed Mokhtar — in a RM1.069 billion deal back in October 2008. Bank Negara’s condition was for it to eventually pare down the stake. DRB-Hicom had previously tried to sell down its stake to Affin Holdings Bhd, Bank Islam Malaysia Bhd and Bahrain-based Islamic lender Al Baraka. Industry sources say it has been difficult for DRB-Hicom to close a deal with the parties it has spoken to so far for two reasons — it wanted to maintain control of the bank and its price expectations were deemed too high. “This move to merge with MBSB might work because DRB-Hicom is being pushed into a corner with the Bank Negara deadline looming,” an industry source says. The conglomerate, which is involved in other businesses like automotive, property and construction, considers banking one of its core businesses. Bank Muamalat accounted for about 7% of DRB-Hicom’s RM13.687 billion revenue for the financial year ended March 31, 2015 (FY2015). Bank Muamalat was priced at slightly less than 1.2 times book value when DRB-Hicom bought its controlling stake. The last Islamic banking transaction in the country, in December 2013, was done at a price-to-book value of 1.8 times. This was when BIMB Holdings Bhd bought the remaining 49% stake that it didn’t already own in Bank Islam Malaysia Bhd for RM2.86 billion from Lembaga Tabung Haji and Dubai Financial Group. Analysts said the price was decent relative to the bank’s return on equity (ROE) of 15% to 16%. Bank Muamalat’s ROE is lower, at 5% in FY2015. The merger will likely be a cash-and-stock deal.